EXASOL, London, 12th June 2017: Match2Lists has chosen EXASOL as the in-memory analytic database engine to run its innovative data matching and cleansing cloud. Match2Lists allows customers to rapidly and accurately clean and unify data from disparate systems and sources, and is used in multiple sectors including travel, pharmaceutical, FMCG and financial services. Creating a single unified view of customers and prospects, from all the data available is key to turning it into actionable information. Matching numerous internal data (sales, marketing and account management) with external sources (third party and partner data) is complex and time consuming given the endless variations of spellings of company names, addresses as well as considering all the ways that a person’s name can be spelled or shortened. To be able to do this needs a matching algorithm with intelligence. The more data that is successfully matched and deduplicated, the more information you can piece together from the disparate sources. Match2Lists.com combines the most advanced data matching algorithms with a visual interface to allow companies to accurately match millions of records in minutes. Amr Hassan, co-founder and CEO of Match2Lists says: "Match2Lists looked to the market for a fast in-memory database engine that could underpin the company's matching algorithms. When we tested EXASOL in a proof of concept trial, it is an understatement to say we were extremely impressed. Seeing hundreds of millions of records matched in seconds simply blew us away. “With a database engine like EXASOL underpinning Match2Lists, it means that our clients can start and finish big data projects in minutes. However, the benefits did not stop there. With our previous solution, we would have needed ten times the RAM we have now to even come close to speeds achieved by EXASOL. “With EXASOL we are achieving faster speeds at a lower cost in a package that is much easier to manage." In short order, Match2Lists signed up to EXASOL's cloud and hosted service offering: EXACloud. 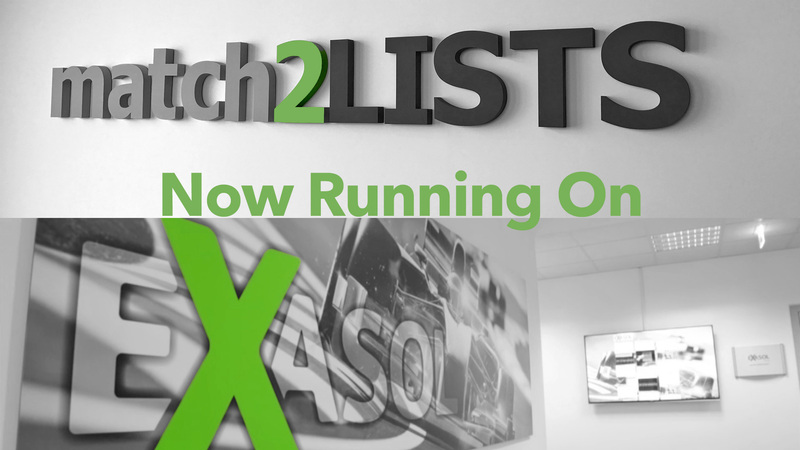 Match2Lists has leveraged some of EXASOL's advanced features to further increase its speed. By running algorithms in parallel directly in the database, it has been able to take Match2Lists' performance to the next level. Match2Lists is the world's fastest, most accurate and easiest to use data matching and data cleansing solution. If you have any questions of enquiries we'd love to hear from you.